Slovenia was part of the Austro-Hungarian Empire until it was dissolved at the end of World War I. In 1918, the Slovenes, Serbs and Croats formed a new multinational state which was later known as Yugoslavia. Slovenes established their independence from Yugoslavia in 1991. Slovenia is now a member country of the European Union. It is bordered by Italy, Austria, Hungary, Croatia and the Adriatic Sea. Slovene is the official language. According to the 2002 census, the main ethnic group of the country is Slovenes (83%) followed by at least 13% of the population being immigrants from other parts of the Former Yugoslavia. The Slovenian population data represent DNA samples from 193 Slovene individuals who were involved in legal proceedings concerning various forensic testings. Samples were obtained by the Forensic Laboratory and Research Center in Ljubljana and the Institute for Genetic Engineering and Biotechnology in Sarajevo. The Slovenian population data represent DNA samples from 207 randomly selected, unrelated individuals of Slovenia. STR frequencies were reported in the most recent European database release of the Working Group of the European Network of Forensic Institutes STRbase Project (http://strbase.org/frequencies). 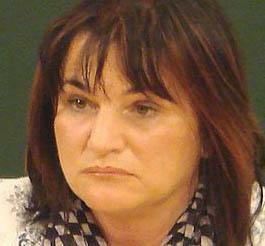 Photo: Marija Sulics Leskovar of Ljubljana at the Slavistic congress in Trieste in 2007. Photo by Matjaž Zaplotnik. Wikimedia Commons. Source publication: Slovenia (population 284): Allele Frequencies for the 15 Short Tandem Repeat Loci in Slovenian Population, JFS, 2005, p1505-1507. Slovenia (population 451): ENFSI DNA WG STR Population Database v. 2. (strbase.org).